Your cooker, smoker made it to Longmont, Co, on Thanksgiving am. Gordon and his 77 ford f-150 loaded with new smokers arrived at 7:00 am. We proceeded to unload my 36, with no problems. 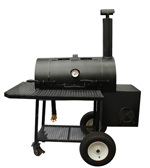 I used my portable folding rams which I use on my small 4’X8’ trailer, to help with the unloading, safer not to wreck that Beautiful new well-built smoker!!!! 324 degrees and 4 hrs., came out perfect, the moistest turkey I’ve ever eaten, 63 years old, brought up on a farm, worked construction for 40 years. So I started a fire in the new Lang”s # 36 patio, was not intimated with the smoker , watch your video, and open all the door, and pin wheels and watch the fire, carefully, very dry and windy in Colorado, got to be careful with the fire, brought it up to 300 degrees and washed her down, after oiling everything down on the inside, with cooking oil. Brought it back up to 300+ degrees, and washed her down again, threw some old oak whiskey barrels that we had here for over 20 years, very little wood is used to make a good fire, AND BRING UP THE TEMPERATURE, put the damper on the smoke stack on 3/4 shut and let it smoke for 2 hrs., watching for the fire trucks to come,I’ve have lousy neighbors!!!!! So Friday I went out and started a good fire with oak pieces and to get the cooker up to 300 degrees, closed everything up and let the fire settle down and added charcoal, don’t have good hard wood out here only Pine and Pine all kinds of pine, Got my ribs all ready mustered and seasoned, and room temp, got everything down to 230 degrees and started cooking the 2 racks of St Louis style ribs, 3-1-1- Bill Anderson, just like he said in his book, I even made a finishing sauce, using sweet baby Ray’s BBQ sauce, with real honey, apple cider vinegar garlic, oil and fresh ground pepper, warmed on the fire box of the new Lang. Flipped them over after hrs. and sprayed em with apple juice, and the 3 hour spayed them again with apple juice, rapped them in aluminum foil for another hour, I was using hickey chunks and apple chunks for the first hrs. and only charcoal to heat with works great getting better with the new machine, very easy to control the heat, easy. took the ribs out of the foil, and used my new sauce on the bone side let it set half hour, flipped the ribs over more sauce on the meaty side, and told my bride the ribs will done soon, after the half hour brought them in the house covered the let sit for 15-20 minutes, made my Bush’s beans modified on the fire box with honey, mustard spicy hot stuff pepper a little garlic warmed on the fire boxed, so now weight on Mary’s response to the new Smoker, She did not like the ribs I did on The Chair Griller, too Smokey tasted lousy, Mary tell it like it is,. So she take a bite and tries the beans and took some more rib, she turn, and said” the best ribs I ever Eaten!!!!! !, and after words I asked her if she had any heart burn she said no. So Ben we had a great Thanksgiving, and thanks again for all your Help, and building such a Great Smoker.